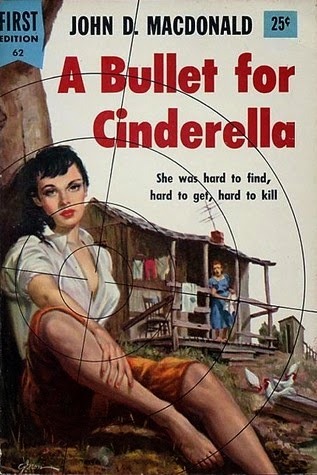 This is a stand-alone novel, first published in 1955, and written by John D. MacDonald, who is best known for his Travis McGee series. It's a classic Fawcett/Gold Medal novel in which the protagonist starts out with an apparently reasonable objective but soon finds himself in over his head and in danger of losing his life in some very unpleasant way. In this case, the protagonist is a man named Tal Howard, who had the misfortune first of going off to war and then of being captured and sent to a prisoner of war camp. The camp, of course, was a horrible experience and while there, Tal became friends with another prisoner named Timmy Warden who came from a small town named Hillston. Sadly, Timmy died in the camp, but before he did so, he confessed to Tal that he had stolen $60,000 (at a time when that was still a lot of money). He had embezzled the money from his brother, George. To add insult to injury, Timmy had also been sleeping with George's trampy wife, Eloise. Timmy tells Howard that he buried the money and that only a woman named Cindy would know where to find it. Timmy regrets all of this now, and hopes only to survive long enough to return to Hillston and make things right with his brother. Timmy dies before he get a chance to make amends. Tal Howard is eventually rescued from the camp and after he recovers is at loose ends. After his experience in the war, he has no interest in resuming his old life and so decides to go to Hillston, find the mysterious Cindy, dig up the money and live happily ever after. Naturally, this won't be easy. And once Howard reaches Hillston, he realizes just how complicated a task he has set himself. To make matters worse, there's already another ex-POW from the camp named Fitzmartin, who apparently heard part of Timmy's story and who's arrived in town ahead of Howard, also determined to find the money. Fitzmartin is a psycho S.O.B., typical of the villains that MacDonald tended to create, and obviously he's going to pose a formidable obstacle in the way of Howard's objective. If all that weren't bad enough, little Hillston proves to be a town with a lot of dark secrets and mysteries, and the deeper Howard digs, both literally and figuratively, the more trouble he's going to be in. Along the way, naturally, he'll also encounter any number of interesting females, and the end result is an engaging tale that should appeal to any fan of classic hard-boiled crime fiction.